This module will bring you up to date with developments in the evidence-based veterinary medicine (EBVM) movement. It includes a summary of key messages from the Veterinary Evidence Today conference in Edinburgh in November 2016. It also includes links to practical resources for those who want to develop skills in EBVM and/or want to get involved in practice-based research. Andrea Tarr attended the Veterinary Evidence Today 2016 conference. This report is based on her own perceptions of the event. The concept of EBVM represents the rational move away from practice often based on anecdotal or subjective experience, to one based on a systematic evaluation of evidence integrated with experience. Essentially it means using the best information to guide clinical decision making. There are several notable landmarks in the development of EBVM in the UK over the last few years. In 2009, the Centre for Evidence-based Veterinary Medicine (CEVM) was established at Nottingham University with the aim of increasing awareness and use of evidence-based principles in the veterinary profession. In 2012, the Royal College of Veterinary Surgeons (RCVS) Charitable Trust decided to champion EBVM globally and become the evidence hub for the profession. (RCVS annual review 2012; 2013). This function, combined with the library and information services and historical collection, comes under the umbrella of RCVS Knowledge. In 2014, RCVS Knowledge held the first international EBVM Network conference. This highlighted the low quantity and often poor quality of veterinary scientific evidence and the need for more and better research, particularly practice-based research. In 2015, RCVS Knowledge launched Veterinary Evidence online for the publication of knowledge summaries and articles on EBVM; and EBVM Learning, an online tutorial that introduces the principles and methodology of EBVM. 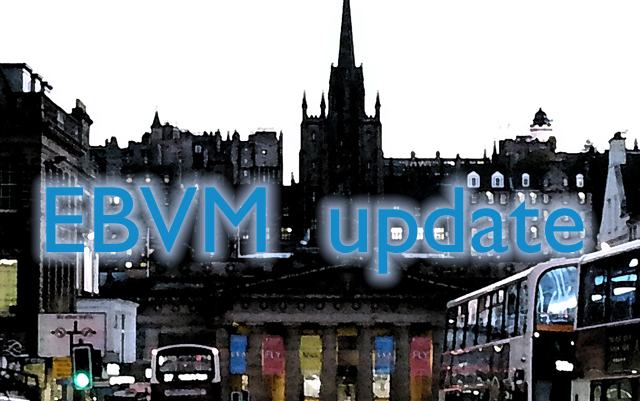 RCVS Knowledge held its second EBVM Network conference in Edinburgh in November 2016 to promote collaboration and exchange of ideas, and to help build research networks across disciplines in the UK and internationally. As well as presentation of some clinical research, the main themes were methodology, teaching, and the business case for EBVM. What follows is a summary of some of the key messages. Podcasts of the presentations can be found on the RCVS Knowledge website. Unfortunately, a lot of research is wasted, usually because it asks the wrong questions, is badly designed, not published or poorly reported. It is not a problem unique to veterinary medicine (Chalmers & Glaziou 2009). Some of these problems can be tackled with initiatives that aim to improve the quality of reporting (e.g. the EQUATOR network), reduce wasted research (www.researchwaste.net) and ensure that all research is published (VetAllTrials). The relevance of research to practice needs to be improved. Research data are often unrepresentative of animals seen in general practice. This is because, traditionally, research has been done in academia using data gathered from referral centres. Also, research does not always ask the right questions because it does not involve people for whom the results matter. For example, many studies of drug treatments are done to gain marketing approval. Consequently, such trials do not answer questions that arise in practice (e.g. is it safe to use an NSAID in a dog with liver disease) because such studies usually exclude specific groups of animals (e.g. dogs with liver disease). One way of making research more relevant to veterinary practice is to base it on data collected in day-to-day general practice. The data must be anonymised and collected in a way that does not take time or interfere with practice. In the UK, Vet Compass, SAVSNET and the Veterinary Clinical Trials Network are research organisations that collect data from participating veterinary practices and use them to generate important and relevant research results. To make research more relevant it needs to move from academia to practice. Research activities in practice can range from uncomplicated clinical audit to multi-centre clinical trials and can involve everyone in the practice team. Research that is used to establish current practice helps identify areas of priority for research. Some of the realities of practice-based research were revealed in a progress report from an RCVS Knowledge-funded project designed to build a research network in a multi-site private veterinary practice. Participants prepared knowledge summaries and conducted retrospective and prospective research. The project showed that practitioners have a high level of internal motivation to improve personal professional practice, improve animal welfare and contribute to the profession more generally. It also showed that time is a key factor and that in addition to skills in evidence searching and critical appraisal, complex research projects require a wide range of skills and capabilities related to the practical aspects of running a research project. Most graduates do not have these skills and will need time to develop them. increased confidence in dealing with clients. The survey also revealed several perceived barriers to EBVM, including a lack of time and resources, and an industry culture of basing practice on anecdotal evidence. Employees want managers to encourage, support and invest in EBVM – for example, with opportunities for training and attending journal clubs and discussion forums. Practising EBVM and the possibility of being involved in research were seen as factors that could be rewarding and lead to increased job satisfaction, better confidence and an inspiring, intellectual and challenging environment in which to work. The change in practice structure (through corporatisation) could bring opportunities for practices to work together. There is a variety of EBVM learning resources available on the RCVS Knowledge website and links to other providers of educational material. Few people have the necessary skills and resources (e.g. case-load, time, research expertise, financial support, access to ethics committees) to be able to produce good-quality and relevant clinical research on their own. There are several initiatives that will help practitioners who want to get involved in research. Advice on designing, running and analysing research projects is available from the Clinical Research and Assessment Guidance Panel (CRAG) and from the British Small Animal Veterinary Association (BSAVA) and British Veterinary Nursing Association (BVNA). An Ethics Review Panel has been created to review practice-based research projects. The panel is running for a 1 year trial until the end of July 2017. Opportunities for general practitioners to take part in multi-centre research are available through the Veterinary Clinical Trials Network and the Association for Veterinary Soft Tissue Surgery, an affiliate group of the BSAVA. Before embarking on research, it is necessary to see what research is already available and appraise its quality, with the aim of ultimately integrating new evidence into practice. The best way to do this is with a systematic review. This requires specialist training and is time consuming. But the number of published veterinary systematic reviews is growing and these are collated in the VetSRev database. A less rigorous but quicker and more achievable method of review is to prepare knowledge summary (also known as a critically appraised topic [CAT]). This is a short critical appraisal of the literature addressing a very specific clinical topic, but still with the aim of integrating evidence into clinical practice. The CEVM produces knowledge summaries (published online at Best BETS for vets). EBVM is a collaborative movement and veterinary practitioners are encouraged to prepare and contribute knowledge summaries for publication in Veterinary Evidence online. A guide to preparing them and practical help is available from RCVS Knowledge. Of course, evidence summaries on their own are not enough: the evidence needs to be put into the context of clinical practice and there’s a need to consider factors such as client and patient values, harms, cost and practical factors. Given the current paucity of evidence, it is common for a knowledge summary to reveal the lack of research on a topic. Nevertheless, this is important for revealing uncertainty and showing where research is needed. Research will always be needed to improve the evidence base for the practice of veterinary medicine. However, there is a lack of published research, particularly research that is relevant to general practice. The remedy is to generate more research in practice. Research organisations, with little effort from the profession, are collecting data from practices. But research at all levels (from clinical audit to clinical trials) is also needed. A change in culture requires the involvement, engagement and collaboration of the veterinary profession. Students are now being taught evidence-based veterinary medicine (EBVM) skills, but those already in practice will need to acquire them. It is important to acknowledge the challenges that this might present in terms of time and the need for practical support. It is too early to know if there are cost benefits from EBVM and, so far, there has been little discussion about costs, including who pays for more complex research projects. But one of the biggest benefits to the practice team may come from increased job satisfaction and an opportunity to work in an inspiring and challenging environment. Specific learning objectives: to improve knowledge and understanding of EBVM. Click the button below when you are ready to answer the CPD questions based on the EBVM Update module from Veterinary Prescriber. Once complete you will be emailed with the results of your EBVM Update CPD along with the answers so make sure you enter your email address carefully at the head of the form so you can receive your certificate. Where is the Centre for Evidence-based Veterinary Medicine based? Which of the following organisations routinely collects practice data? Which of the following is not true about systematic reviews? Which of the following is true about knowledge summaries?